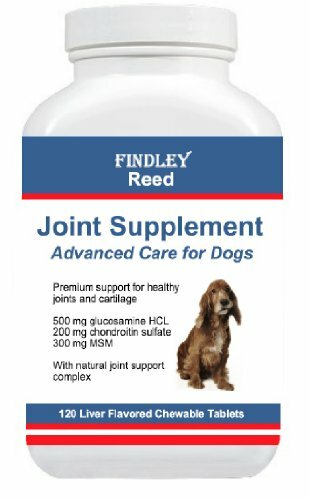 Findley Reed Joint Supplement for dogs is a dietary supplement made from natural ingredients to help dogs maintain healthy joints. It is made with an advanced formulation of ingredients to aid recovery from dog hip or joint injuries, help senior dogs with decreased mobility, and for dogs requiring dietary assistance for healthy joints. Key ingredients include Glucosamine, MSM, Chondroitin, Vitamin C and Hyaluronic Acid. Glucosamine is a precursor to a building block of cartilage and helps the body maintain synovial fluid, which helps lubricate joints. MSM (Methylsulfonylmethane) is a natural source of sulfur in the body, is believed to help form connective tissue, and may also slow nerve impulses, which signal pain. Studies have shown that the benefits of glucosamine can increase when taken with chondroitin. Vitamin C (ascorbic acid) is needed to support the growth and repair of tissues throughout the body and helps the body make collagen, an important protein used to produce cartilage, tendons and ligaments. Hyaluronic acid is a major component of synovial fluid, which helps lubricate joints. Active Ingredients: Glucosamine HCL, Methylsulfonylmethane, Chondroitin, Yucca Extract, Turmeric Extract, Boswellia Extract, Hyaluronic Acid, and Manganese. Contains 120 liver flavored chewable tablets. Directions for use: Administer orally twice daily. Dogs under 30 lbs. - 1 tablet; 30-60 lbs. - 1 1/2 tablets; over 60 lbs. - 2 tablets. After a response is seen, product may be gradually reduced by up to one-half to a maintenance level.